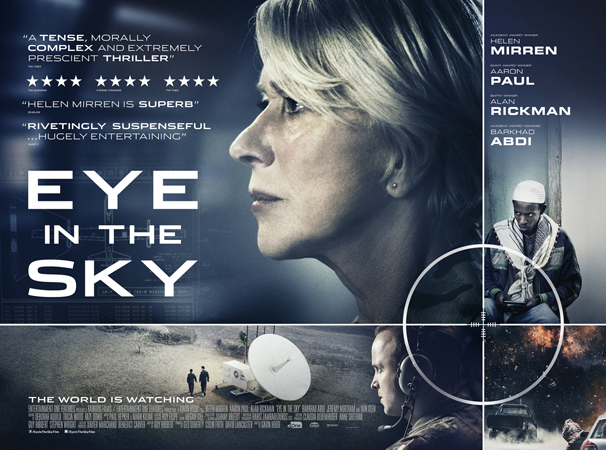 Audiences and critics are loving nail-biting drone thriller Eye in the Sky starring Helen Mirren, Alan Rickman and Aaron Paul in cinemas now and we’re giving you the chance to win a poster of the film signed by Dame Helen Mirren and director Gavin Hood. London-based military intelligence officer Colonel Katherine Powell (Helen Mirren) is remotely commanding a top secret drone operation to capture a group of dangerous terrorists from their safe-house in Nairobi, Kenya. The mission suddenly escalates from a “capture” to a “kill” operation as Powell realizes that the terrorists are about to embark on a deadly suicide mission. From his base in Nevada, American drone pilot Steve Watts (Aaron Paul) is poised to destroy the safe-house when a nine year old girl enters the kill zone just outside the walls of the house. With unforeseen collateral damage now entering the equation, the impossible decision of when to strike gets passed up the “kill chain” of politicians and lawyers as the seconds tick down. For the chance to win this amazing prize simply watch the trailer and answer the question below. What insect is the drone shaped like, that is used to spy inside the house?